Re-designing the New Classic shirt. So, I wanted to design/redesign the Classic Button-down Shirt that I had sold by the thousand when I had the shops and mail order catalogues. 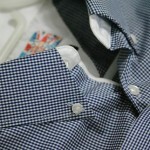 I knew it had to be based on the classic, button-down collar, sewn in box pleat, hanging loop etc. but wanted to make it both retro/classic AND NEW. So, what I have done is change the collar to make it slightly longer, which is more in keeping with the VERY original button downs of the early sixties, but have kept the “spread” (the distance between the points of the collar) the same as they always were. 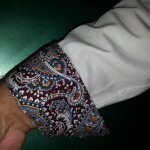 This means that if you want to wear a tie, either a real slim Jim, or something a bit wider, the collar “sits” rather than being “thrown out” by the tie knot. And if you want to wear it open necked it doesn’t sag down. However I got there in the end. The biggest change is that I’ve given it a more relaxed fit instead of the very narrow fit of old. I think a comfort fit is the best way to describe the cut I’ve given them. 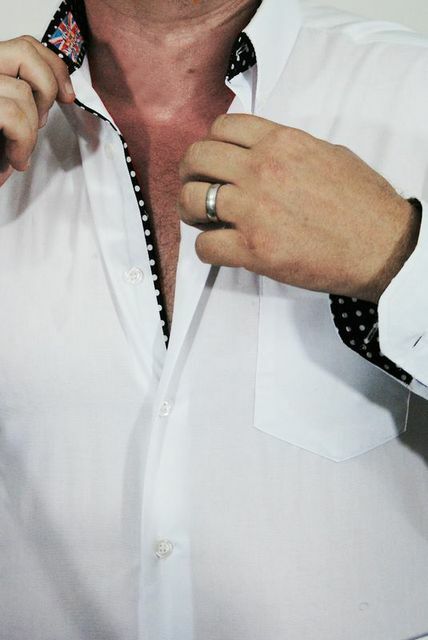 There is NOTHING worse than the shirt buttons gaping showing Carling and Pizza across the stomach, and of course having to not breathe out when you’re chatting some one up!! This makes the shirt really comfortable to wear, hence the “Comfort Fit” name. Also, because it’s essentially a “smart” shirt I have lengthened it a smidge so that if its tucked into trousers it has more of a chance of staying “tucked” and shouldn’t ride up to reveal your Calvin Klein’s! (or your M & S’s). Having said all this, I have kept the bottom”´shaped” so that if you want to wear it un-tucked it still looks great. 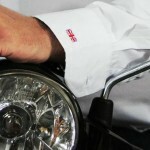 It’s essentially a smart shirt so that if you wear it buttoned up with a tie it looks like a classic plain button down shirt, so for work it looks really tidy with just the Union Jack showing on the breast pocket and sleeve cuffs. 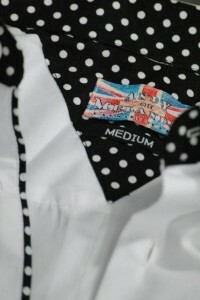 But if you undo a button or 2 you’ll see that I’ve trimmed it with a complimentary contrast fabric. 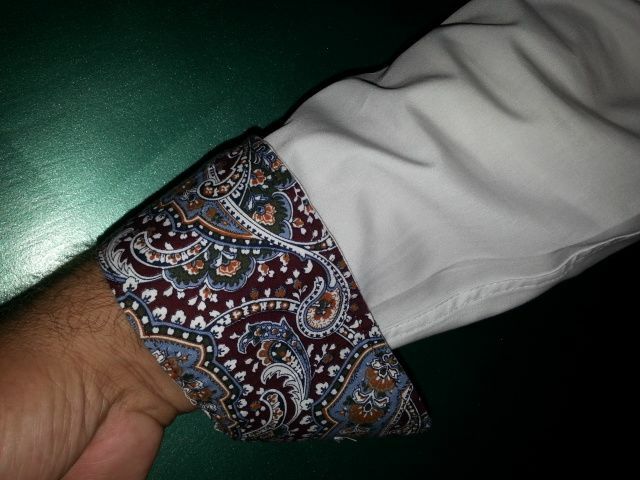 Stripes, Polka Dots, Paisleys and Checks, all the real retro designs but brought bang up to date using these as trims. 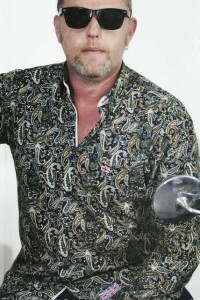 I don’t think this has been done before on this style of shirt, and I want the Andy of Melanddi designs to be that bit different, marking it apart from “The Herd”. 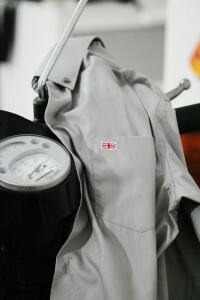 You’ll find the same contrast on the edge of the button side of the front panel, but just a subtle trim. 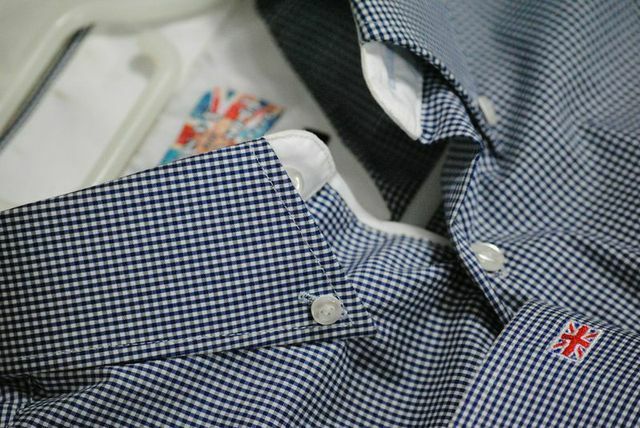 The same contrast fabric is also on the under collar and under cuff. There’s lots of pics over all the pages of this website that should show where all the trims are. 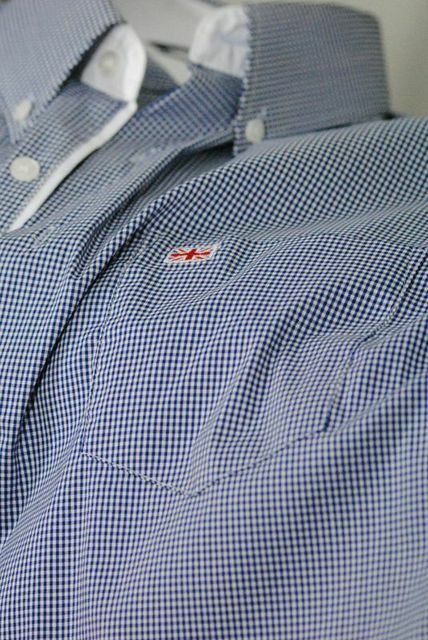 My favourite touch is The Union Jack that I’ve embroidered on the breast pocket and the sleeve cuffs, very discreet and very neat. 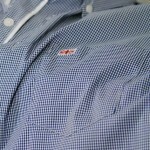 These aren’t there as a mark of Nationalism but rather as a statement that the design of the shirt is fundamentally British. As the inside label states, “A VERY BRITISH DESIGN”. Otherwise branding is quite low key with the Andy of Melanddi labelling only showing if the shirt is worn casually. Sizes are; Small 14-14.5. Medium 15- 15.5. Large 16-16.5. Extra Large 17-17.5 and Extra Extra Large 18-18.5. Sizing is generous, so if you want a slightly closer fit you can get away with ordering a size down from what you would normally order. Judging from the feedback from certain band members of certain bands both current AND back in the day who we will mention later they certainly seem to be the right style at the right time and at the right price.